Maison, 2 chambres, 1. 5 salles de bain. Capacité d'accueil jusqu'à 6. Le lodge Licorne est niché parmi les chênes centenaires le long du côté de la rivière Savegre vierge dans la forêt de nuage de San Gerardo de Dota. Notre région est célèbre pour sa concentration dense de le Quetzal resplendissant qui est recherché par les ornithologues de partout dans le monde. Nous avons pris le petit déjeuner sur notre terrasse avant avec ces magnifiques créatures à plusieurs reprises. Il y a plusieurs haut de gamme éco-resorts dans notre vallée magique, mais nous avons les maisons seulement entièrement équipées dans la région. Nous avons une villa supplémentaire (dreamwater Villa) sur la propriété ainsi. My family (4 of us) loved our stay at Unicorn Lodge! 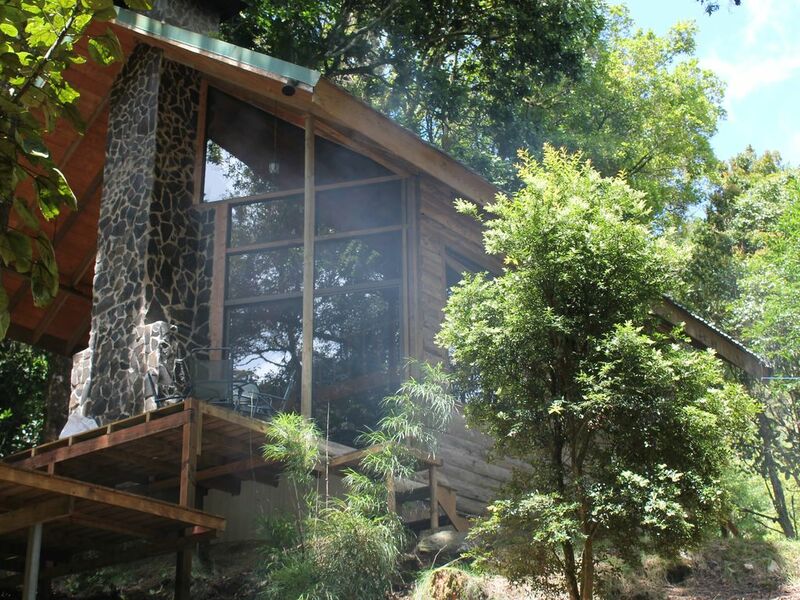 Beautiful place and an unbeatable location in the high country of San Gerardo de Dota. We are coming to the end of a week in this beautiful paradise! We have enjoyed every minute of our stay! Lucky for us Ryan (owner) was here all week too. What an amazing host he has been. He is so full of knowledge and willing to share. I would reccomend Unicorn lodge to anyone! He is constantly upgrading his property and there are several choices to stay in. The area is amazing. Just don’t forget to bring some warm clothes as well the air gets cool early in the morning and late at night. We couldn’t be more satisfied!! Thanks for you hospitality Ryan you ROCK! I should also mention we saw Querzal in the tree in our front yard two days in a row just amazing also we saw two varieties of Toucanet in the yard! This is a great place for a family to use to explore the area.Rushing water surrounds you and we saw a pair of Quetzals early one morning from our bed in the loft - they were beyond the deck.When we arrived, we were greeted by the neighbor, Jasmine, and she was friendly and helped us park( steep) and figure out the place( mostly in Spanish). Birding is great along the road, the scenery is gorgeous. The cabin is beautiful and well equipped if you aren't baking or using the oven much.They need more metal or pyrex baking pans in my opinion, and some pot holders. For example there was nothing to roast chicken on in the oven. We ate out at Marian's one night ;delicious, and also elaborate lunch at Sevegre so we could hike their trails. If you go there be careful of chiggers! It is cold, so bring warm clothes. We used our long johns, warm socks, and wool hats in the mornings and evenings. Afternoons were sunny and warmer, barely 70F. We made fires each evening in the fireplace and the fire starters and wood supply were fine. The shower and bathrooms worked great, but the hot water wasn't very warm.Plush towels and a little electric heater helped make showering ok. New refrigerator, nice countertops and work island, but not bright lighting inside. Beds very cozy and comfortable, but only one with an electric blanket. Lots of utensils and place settings and beautiful flowers. The woodwork on the walls, floors, etc is beautiful. We were very comfortable. We drove a 2WD minivan in January, no problems. We would love to return with more of our family and also rent other nearby cabins. Thank you for allowing us to use your beautiful spot. We loved Ryan’s cabin and San Gerardo de Dota. The cabin’s location is unbeatable. We didn’t see any quetzals but did see a ton of other interesting birds from the deck, including emerald tucanets and flame tanagers. The cabin was really well equipped and we were comfortably warm sleeping wth the small heater. The cabin living area was pretty cold until we managed to get a fire going. My only suggestion is that it would be nice if some wood were placed inside the cabin to have a chance to be drying out before a visitor’s arrival. The wood was very wet and it was difficult to start a fire with it. All in all, the Unicorn Lodge is really special and we’d return in a heartbeat. If you go, don’t miss Miriam’s. Her trout casado was so good that we ate it two days in a row. This was our first visit to Costa Rica together. We loved the cloud forest with its tranquil green mountains and magnificent bird experience. We would gladly advise a stay here for anyone seeking to experience Costa Rica. The cabin was filled with rustic charm. Everything you would need is provided for in the kitchen. There were bathrooms up and downstairs including a shower downstairs. there were broad windows giving panoramic views . The view of the river was lovely. The property manager was very helpful and friendly. The locals were warm and friendly and we found Miriam's Cafe uphill. We enjoyed the home made cooking everyday while amazed by the diversity of the colorful local birds. For the first time in our lives we saw Quetzales. For a Guatemalan like myself it was almost a mystical experience. if you are thinking about visiting Costa Rica do not hesitate to come here. It is beautiful and magical. We enjoyed our stay at Unicorn and in the Gerardo de Dota area. There were many activities and good restaurants nearby. A caretaker lives next door who was available to help with any problems and to suggest good tour guides. The highlight was a fantastic tour with Melvin Fernandez, who not only found us quetzals but spotted and named almost 50 other birds. The stars were amazing at that elevation but be prepared for cold nights. Situé dans la forêt de nuages ​​vierge de San Gerardo de Dota ..... ce domaine est souvent appelé le secret le mieux gardé dans l'ensemble de Costa Rica. L'un des rares endroits sur la planète pour voir le Resplendissant Quetzal, San Gerardo de Dota est vraiment un must sur votre visite dans ce pays étonnant. San Gerardo de Dota est situé près de l'autoroute 2, à environ 2-3 heures de San Jose et à 2 heures de Dominical. Comme partout au Costa Rica, la signalisation est pas le meilleur; cependant, il y a un petit panneau à la bretelle de sortie. Il aide à garder à l'affût des bornes kilométriques. San Gerardo de Dota est situé au kilomètre 80. Une fois que vous éteignez la route 2, vous descendez dans la vallée pendant environ 15 minutes, manoeuvre vers le bas plusieurs lacets raides avant d'arriver au village. Juste une route principale qui traverse la ville donc il y a peu de chance de se perdre. Laisser tôt dans la journée: Conduire après l'obscurité sur la route 2 est pas recommandé. La route est venteux et raide et la visibilité peut être très limitée quand il pleut ou les nuages ​​couvrent augmente.